I wanted to do a follow-up post about another process-based art project! 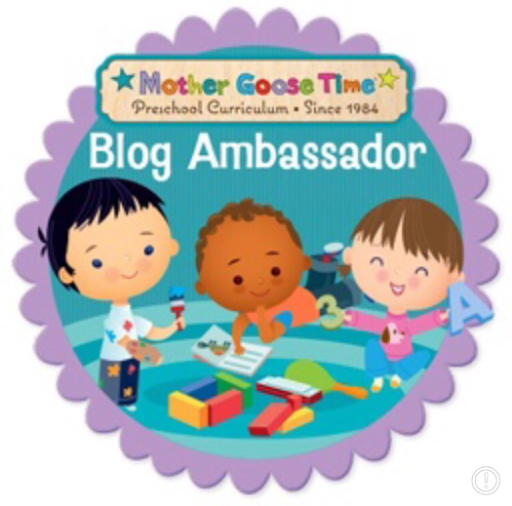 My aim is to make this quick and just describe exactly what happened so you can get greater insight into what a Mother Goose Time (MGT) process-based art lesson looks like! Is it possible for me to create a short and to-the-point blog post? I'm not entirely sure but I am certainly going to try. 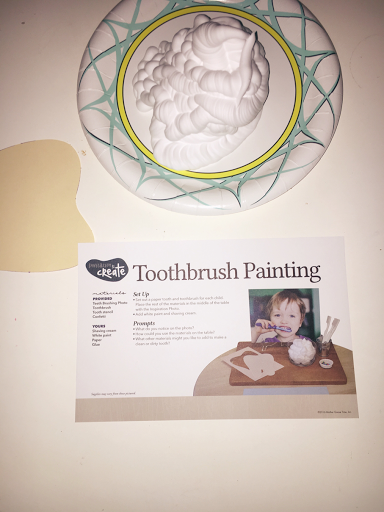 This "Invitation to Create" project was a toothbrush painting. Tiny B and Strong B already had some background knowledge on teeth and toothbrushes (as most kids do) because Strong B has had two cavities and Tiny B has gotten three teeth pulled so far. The project called for me to lay out shaving cream, toothbrushes that were included, a paper cutout of a tooth, and confetti which was included. 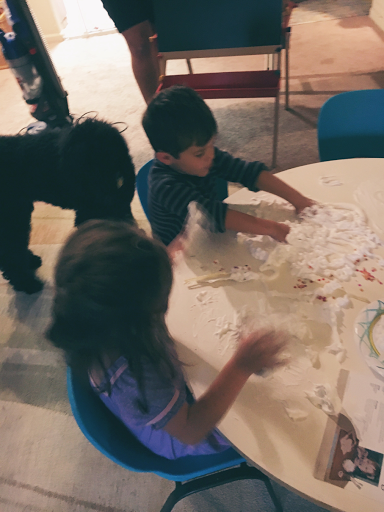 They were both timid about touching the shaving cream with their hands. I teased both of them for this as Tiny B used to have sensory issues with food (obviously. 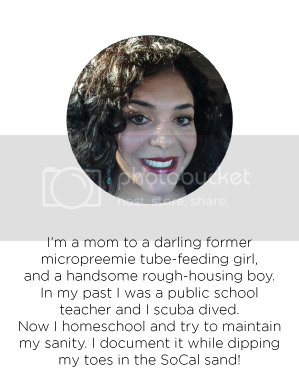 Feeding Tube. Need I say more?) Strong B grabs spiders and bugs every day. 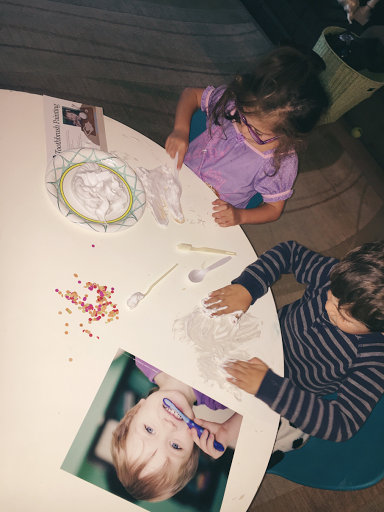 But in all seriousness, this sensory play was extremely beneficial to them. Opportunities to touch safe things and bring them out of their comfort zones contribute to building courage and adventure. We all need that. 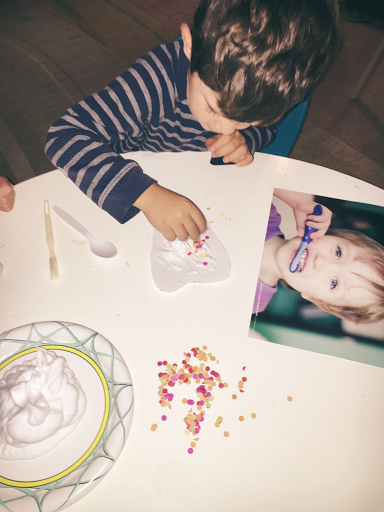 Strong B used his pincer grasps and put confetti on the tooth. This was excellent practice for fine motor planning. Oh, look! 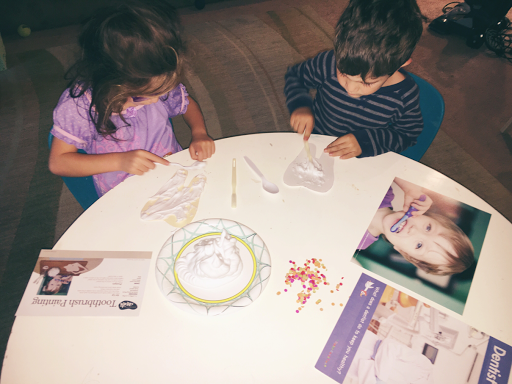 Their hands are in the shaving cream! They are willingly touching it! And having fun! We discussed brushing our teeth and the dentist and cavities. 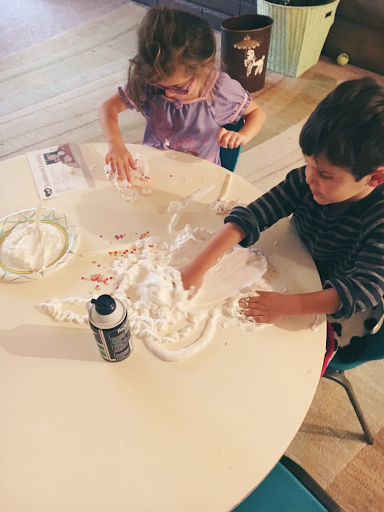 Just working with shaving cream and being in control of their own creation allows them to think more about the subject matter rather than copying an art project perfectly, which can be extremely stressful for some children. They asked me tooth-related questions and we discussed all things teeth. Now they're really getting into it. The project was getting so enjoyable that I forgot to take more pictures.When mama forgets to take pics, you know that things were really exciting. I got one pretty bad pic of their hands covered in shaving cream, but that was it. It really was that enjoyable. 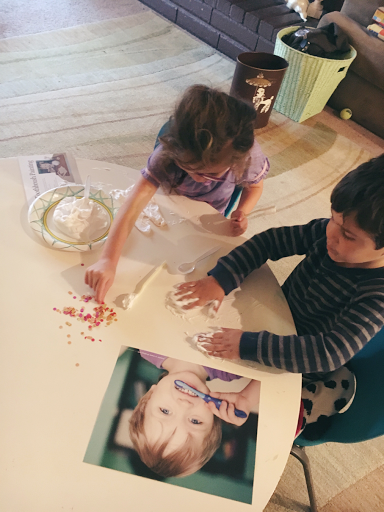 As for what their end project looked like...it was just the tooth with wet shaving cream on it that melted away and a few pieces of confetti. To a person who has no idea about this kind of art experience, it would look like a project that was lacking. To the kids and myself, it represented a whole-lotta different types of learning and skills as well as just plain fun.